Klintevej in the small town of Rødvig on the southern tip of Stevns, was in the middle of the last century closely occupied by small pensions, where citizens from Copenhagen came to vacate in the charming town with the beautiful sorrounding nature and with The Cliffs of Stevns as a big attraction. The pensions closed later and became private residents. In the begining of 2013 the owners of the well established Rødvig Inn & Seaside Hotel saw an opportunity to resume this type of vacation and bought the house at Klintevej 28 and renovated it totally. It has now become Stevns Klint Beach House. The Beach House is located with a view of the fields, Stevns Klint and the Baltic Sea and has with its lovely big garden, the many terrasses and the stairs to the beach a lot of oppportunities for outdoor activities. Keywords for the pension is peace, silence, beautiful nature, stunning view and a simple but nice decoration. The house is ideal for biking and hiking tourists. Ideal for larger groups (up to 25 persons), ex. courses, family get togethers. Rødvig Inn & Seaside Hotel can prepare and deliver your meals. The whole Beach House can be rented for larger groups on day- or weekly basis. Stevns Klint Beach House will be unstaffed, but on special occasions we can offer a chef or waiter to serve our guests. 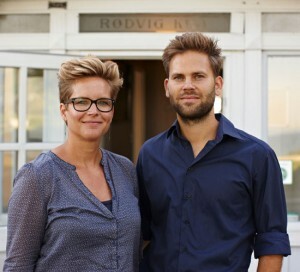 Check in and breakfast (and other added meals) is normally served at Rødvig Inn & Seaside Hotel.